It's always good to make a great first impression on a she-wolf you might be drawn to. Rescuing a boy from a kidnapper at a crowded, busy mall at Christmastime couldn't have afforded Dr. Aidan Denali a better scenario for showing what a hero he could be. 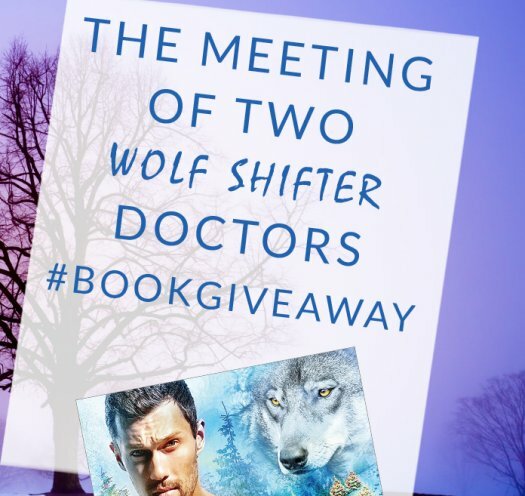 Not that he knew the little boy was a wolf at the time, or that the boy was with the isolationist Seattle wolf pack, but when he meets their pack doctor…Aidan is awestruck. Here's a scene where the two shifters meet. "Doctor Holly Gray, meet Doctor Aidan Denali." Whose tongue is uncharacteristically hanging from his mouth in a very interested way. "And Dr. Aidan Denali, meet Dr. Holly Gray." Who looks just as fascinated with him as he is with her. “Omigod, Joey. I’m so glad you’re safe,” the woman said, drawing close to Aidan, her eyes filled with concern. She was maybe five-four or five-five, her snow boots adding another inch to her height. Aidan smelled her feminine floral scent and that she was a gray wolf too, both of which had him taking in a deeper breath, and a lot more of a look. She was wearing a blue parka and glittering white sweater, her cheeks a little flushed from trying to chase down the boy, her blond hair pulled into a bun, and soft straggles of blond curls framing her pretty face. It was soft and oval, not harshly angled. Her clear blue eyes sparkled under the bright store lights, captivating him. For a minute, he just stared at her, and then he snapped out of his uncharacteristic fascination for a woman. He was glad that she was a wolf, which helped to convince him that the boy belonged to her, or her pack. “His mother’s friend.” The woman gave him an annoyed look when he didn’t release Joey to her right away. “My sister was babysitting him, but he got away from us.” Then her eyes widened. She must have smelled that he was a wolf also. She reached for the boy again. Aidan still didn’t hand him over. Now it was more of a case of learning just where these three, her sister, the teen included, were from. The Seattle pack? Or another? Ted was already calling the police about the woman who had tried to leave the store with the little wolf boy. Thank God she hadn’t managed to leave before Aidan found her and stopped her. “Denali,” the older blond practically whispered, her eyes wide. “I’m Holly Gray. And this is Marianne, my younger sister.” Now Holly seemed eager to meet him, and he was relieved. “Dr. Holly Gray,” Marianne said, as if she didn’t want Aidan to think her older sister was any less important than him. She was the doctor Everett had told him about, and a friend of his sister. “Dr. Holly Gray.” Aidan smiled at both the ladies. He handed Joey over to Holly then, but Marianne wanted to hold him. “You would have remembered my sister if you had met her,” Marianne said, a brow raised, her lips unsmiling as she rested Joey on her hip. Mike was still holding onto the attempted kidnapper, the store security with them now too, asking questions of the woman and of them. Aidan’s enthusiasm faltered. He’d hoped they might be more agreeable after he’d saved one of their own. Holly kept looking at the side of Aidan’s head, and he finally felt cool liquid dribbling down it. The attempted kidnapper must have broken the skin when she bashed him in the head with her purse. It was just beginning to throb. Mike and Ted were smiling at him. Yeah, way to get the girl, except she was with the Seattle pack, and that pack had nothing to do with any wolf outsiders. Still, she was taking care of him, maybe because he’d rescued the boy and taken a beating for it. She was so gentle, he really liked her bedside manner. So what do you think? Could you go for the good doctor? Or, uhm, the other good doctor? And why?